Like any good story, a place has multiple sides, fascinating characters that draw you in, unexpected twists, and moments that make you fall in love. You can’t know a story from only reading a few pages, just like you can’t know a place until you’ve been there turning the pages day by day – being surprised by the twists and turns and falling in love with the people. Right in the middle of the chaos of morning traffic in Amalfi’s Piazza Flavio Gioia, I stepped out of the car and walked over to watch the waves crashing against the beach and the sunshine on the water. Much better than the view waiting in the car. 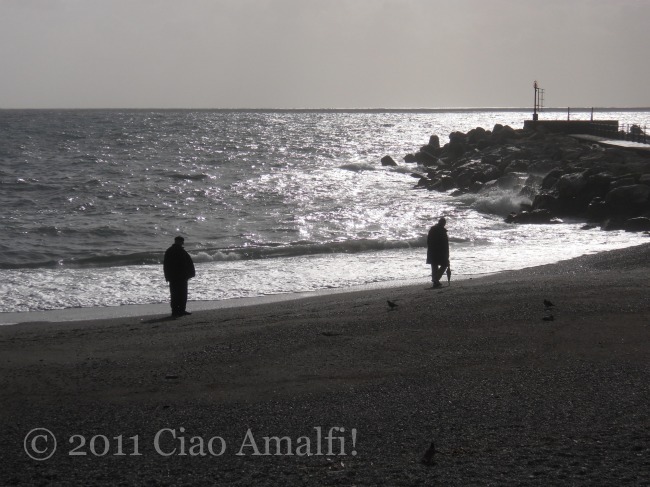 I looked over to the other side of the beach where I saw these two men from Amalfi strolling along the edge of the water. The umbrella, the sunshine, the silhouette – a perfect winter moment. I felt that familiar feeling in my chest as I fell in love with Amalfi just a little more watching this quiet scene. 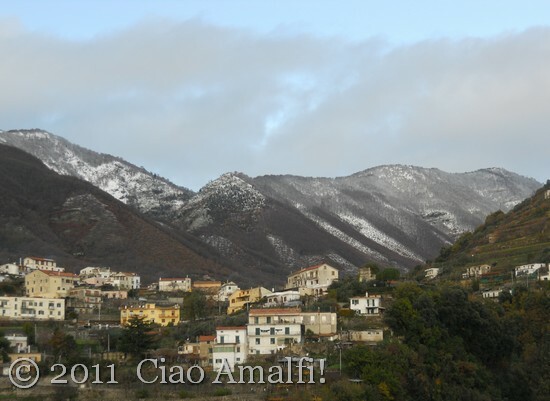 This is winter in Amalfi. Happy Holidays from the Amalfi Coast! This is my third Christmas on the Amalfi Coast, and each year I fall in love just a little bit more with the holiday celebrations, decorations and season in Italy. The simple beauty of Christmas and time with family seem somehow less adulterated by the commercialism of America. 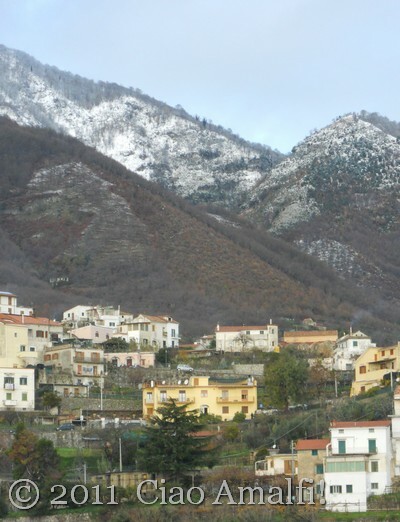 I was pleased to see that Amalfi stepped back its Christmas decorations and lighting this year compared to recent years, in attempt to hold closer to tradition and to save money. Most of the lighting was already in place for the Festival of Sant’ Andrea on November 30th. I’ve read the town has reduced the cost of lighting 50% from last year and the money will be invested in a permanent light display. 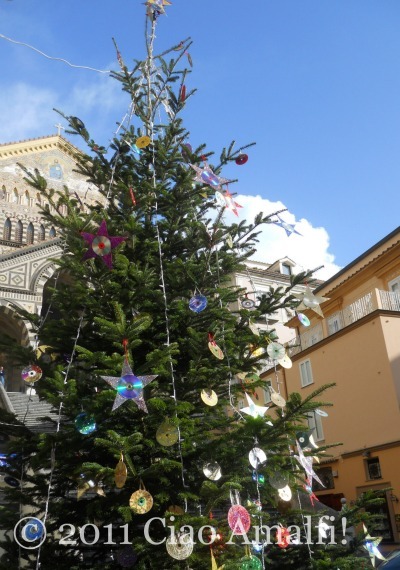 The live pine tree in the Piazza Duomo has been decorated this year with colorful decorations made from recycled materials, including CDs, by a group of disabled kids from the Centro Diurno di Socializzazione in Amalfi. I think they are fun, and I love that they were handmade in Amalfi! 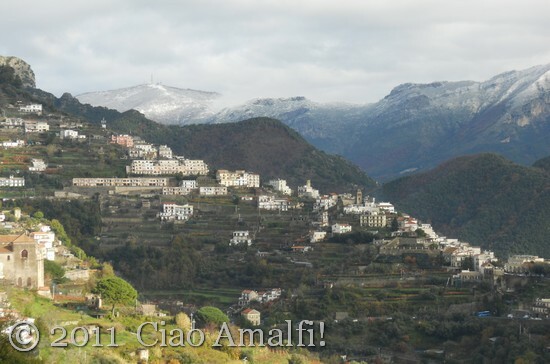 There are many events and concerts for Christmas in Amalfi this year. 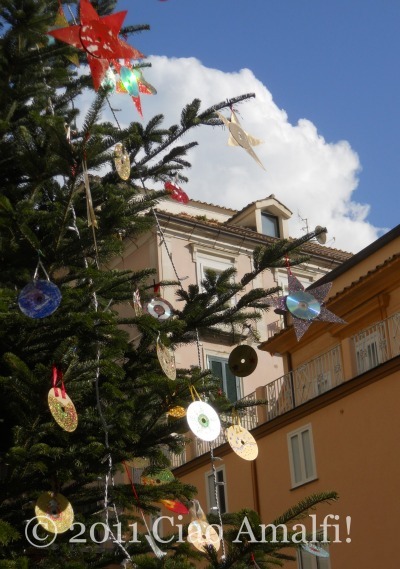 It’s a fun and festive time of year in Amalfi! 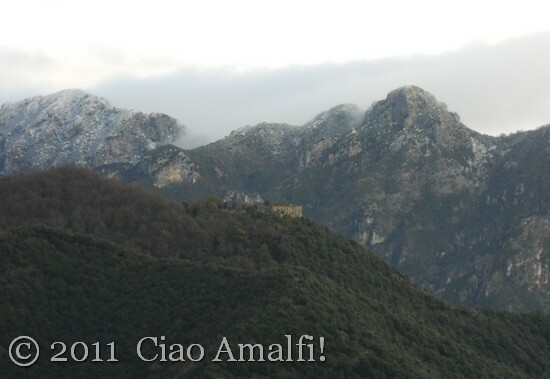 I wish all of my readers a warm and happy holiday time … Buon Natale from the Amalfi Coast! 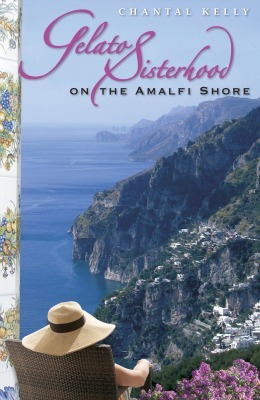 The beautiful Amalfi Coast, travel stories, history, traditional Campania recipes and, of course, gelato – I think I fell in love with Chantal Kelly’s book Gelato Sisterhood on the Amalfi Shore before I finished reading the back cover. 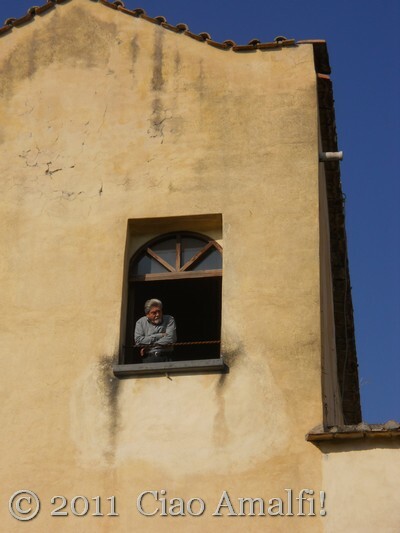 It was a joy to dive into the story and join Chantal Kelly as she takes readers along with her on a seven day tour in Campania, with stops in some of the region’s most iconic spots like Capri, Sorrento and the villages of the Amalfi Coast. Along the way Kelly shares a nice balance of historical details and personal anecdotes from her previous travels in Campania. The book opens in Rome where her group of 10 women arrive to tackle jet lag while discovering some of the city’s ancient and modern treasures. On their transfer to the Sorrento Peninsula in Campania, the group stops off for a visit to explore the ruins of Pompeii. The next day they’re off to discover Campania’s ancient Greek heritage at Paestum. A brief stop at Vietri sul Mare gets the ladies in a flurry of ceramic shopping excitement, but it’s not until their third day in Campania that they get the first full taste of the Amalfi Coast’s beauty by visiting Positano. 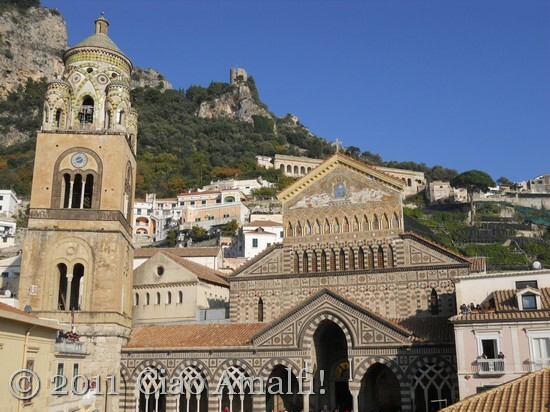 As their travels continue to Capri, Sorrento, Ravello and Amalfi, with wine tasting in Positano and a morning cooking class in Sorrento, readers are also enticed to fall in love with this special part of southern Italy. I enjoyed reading Kelly’s stories from her travels, and loved how they reminded me time and time again of my first trip to Campania in 2007 with my mother. One of her descriptions of the Amalfi Coast particularly hit home with me, and I imagine it will for anyone who has visited here. One could say I’ve made a career out of doing just this. Trying to capture in words—which somehow always seem insufficient no matter how “dazzling” they are as Kelly describes them—that way in which the natural beauty and particular qualities of the Amalfi Coast change something inside of you. There is a shift, sometimes imperceptible in the moment, that you feel has changed you forever. 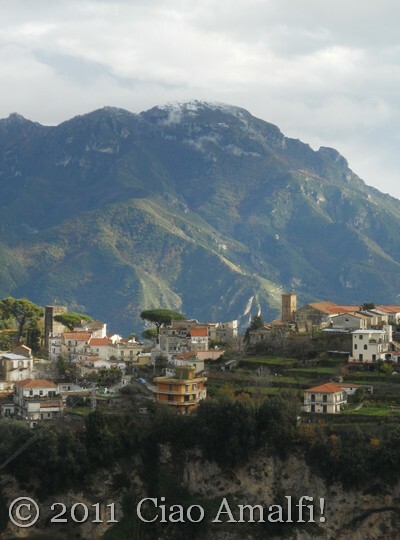 In my case, from the moment I stepped on the tourist bus in Amalfi that sunny February day in 2007, I felt how this place had already begun to stir something deep in me that I am still discovering day by day. Nearly sixty years later, Kelly’s book proves that the Amalfi Coast’s allure is as strong as ever. Whether you’ve always dreamed of coming to this stunning part of southern Italy or you’ve been time and time again, you’ll enjoy joining Chantal Kelly on her journey to Campania in Gelato Sisterhood on the Amalfi Shore. And just to tempt you a little more, here’s the lovely book trailer to enjoy! Visit www.chantalkelly.com and www.gelatosisterhood.com for more information, and be sure to stop by Chantal Kelly’s Gelato Sisterhood on the Amalfi Shore Facebook page for updates, stories and events! DISCLOSURE: I received a copy of this book as a gift from the author. The opinions expressed here are wholeheartedly my own. NOTE: The links in the post are Amazon affiliate links, which means if you click on the link and purchase the item, I will earn a small commission. You will not pay more when buying a product through my link. Thank you in advance for your support! For years I have been wanting to share about the Festival of Sant’ Andrea, Amalfi’s largest religious celebration, here on Ciao Amalfi. 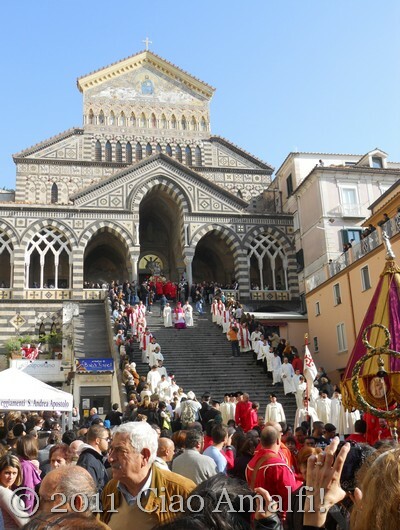 This grand event happens twice per year in Amalfi, the summer religious festival taking place on June 27th and the winter celebration on Saint Andrew’s feast day November 30th. While the same main events take place for both, the June festival is often graced with better weather and summertime crowds. This year, however, an unseasonably nice November ended with a picture perfect sunny day and bright blue skies. As the late morning mass comes to an end, the Piazza Duomo fills with locals and visitors waiting to see the procession leave the church. The bronze doors open and soon the Archbishop Orazio Soricelli makes his way down the steps dressed in vibrant pink and white robes. As the statue of Sant’ Andrea appears at the top of the staircase, I feels as though one collective breath is drawn in from all the people in the piazza. Slowly the men carrying Sant’ Andrea begin to make their way down the steps. My eyes are always drawn to the men in the very front who have to stretch their arms straight up to support the statue during the slow descent. As the statue nears the bottom of the staircase, applause breaks out and the marching band following the procession reaches a crescendo. Phew … safely at the bottom. There is undoubtedly an air of magnificence about the procession of Sant’ Andrea, and it moves me to think of it happening here in this very spot surrounded by the people of Amalfi for so many centuries now. The sunlight catches on the 18th-century silver and gold statue, and you can feel the significance of this event for the people of Amalfi. Otherwise, there is no way a statue of that value would be allowed to be carried down 57 steps of the church! 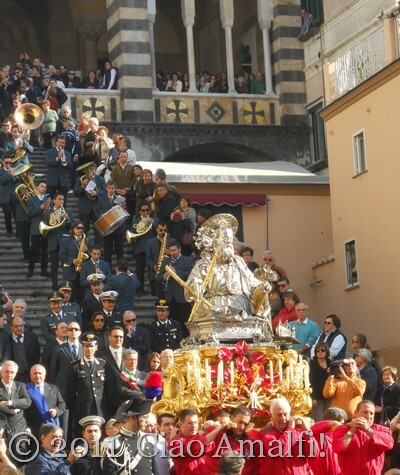 The men of Amalfi dressed in the red jackets have an important job to carry the statue of their patron saint during the procession and return it safely home again. While I was jostled about a bit in the crowd, I did manage to get a few photos and a good view of the procession as it passed by heading up Amalfi’s main street. A richly colored gold and burgundy ombrellino is carried in each procession for the Festival of Sant’ Andrea. It is beautiful to see opened, and I look to try to catch the detailed embroidery around the base of the umbrella. As the beautiful silver and gold bust statue of Sant’ Andrea approached, the procession came to a momentary halt due to the crowded, narrow street ahead. I was able to get a good video of the statue and the men dressed in red jackets who carry the statue during the procession. There are about 15-20 men at any time, but as you can see in the video they switch out when necessary. You’ll spot some men in the front being replaced after that intense trip down the grand staircase of the Duomo. 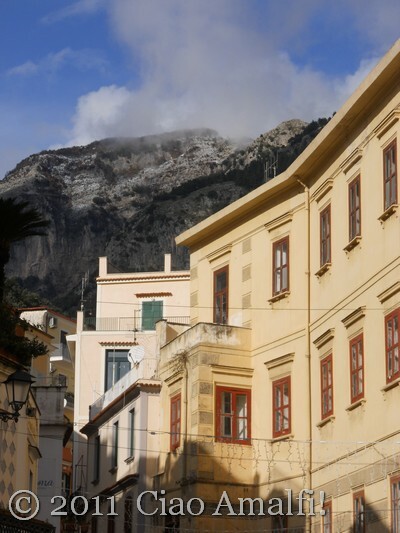 After following Amalfi’s main street to nearly the top of town, the procession returns again to the Piazza Duomo and follows the main road through Amalfi along the Marina Grande beach. We stopped to chat and catch up with family and friends since I had just recently returned from America, but everywhere you looked you could spot people watching for the procession to pass by. In one of its most impressive moments, the procession takes a small staircase down to the beach and walks along the water’s edge to a spot designated by the Archbishop. A blessing takes place there, which dates back to Amalfi’s fishing and seafaring tradition as St. Andrew was a simple fisherman with his brother Peter in Galilee. During the summer festival the harbor is full of boats of all kinds, from brightly colored fishing boats, privately owned boats and even some of the ferries that run up and down the Amalfi Coast during the tourist season. This November there were only a few, but they still added their bit to the celebratory atmosphere by blowing their horns again and again. During the first part of the video above you can hear the traditional song sung for Sant’ Andrea during the procession. After the song ends, listen closely to the sound of all the footsteps falling on the beach pebbles. Next the procession returns to the Piazza Duomo for the most exciting part of the festival’s events – the running of the statue of Sant’ Andrea up the steps of the Duomo. This is sight you must see with your own eyes! 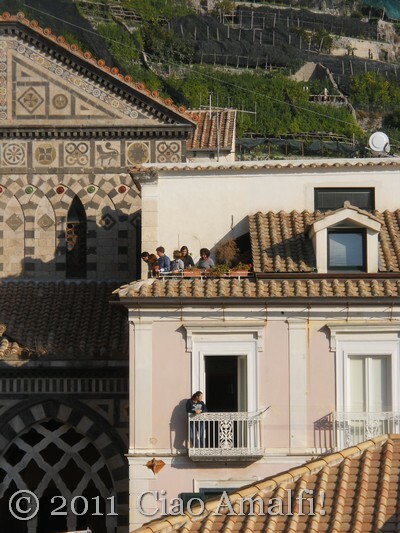 We try to see it from a different spot each time, and this year we stopped to greet some of my fiancé’s friends who own the Hotel Centrale that is located exactly opposite the Duomo of Amalfi. We rushed to the top floor, where the hotel serves breakfast with unbelievable views, and found a little spot to watch the grand finale. A final blessing is given by the Archbishop as the statue of Sant’ Andrea is turned to face the people of Amalfi waiting in the piazza. Then there are several minutes of tension as the men turn the statue around and prepare for the run up the staircase. I distract myself by looking across at the facade of the church to catch the mosaic designs sparkling in the sunlight. The view from the Hotel Centrale is perhaps the best I’ve ever seen the facade of the Duomo, and it made my heart happy. I shot several photos of the facade and bell tower in detail while listening to the sounds of the crowd below and the eager voices on the terrace of the hotel. We weren’t the only ones waiting for this special moment in Amalfi. Every balcony and window was crowded with people looking down on the Piazza Duomo below and waiting for the final signal. I could feel the time was near, and I switched by camera over from photo to video and got ready to capture the running of the statue. The applause begins as the group of men start the run, and bursts into cheers and whistles as they reach the top and turn the statue of Sant’ Andrea around again to face the crowd. I never realize that I’ve been holding my breath until the statue reaches the top and I let it out with grateful relief. Another safe journey of the statue Sant’ Andrea through Amalfi, and now it will be safely returned to the church until next June 27th. 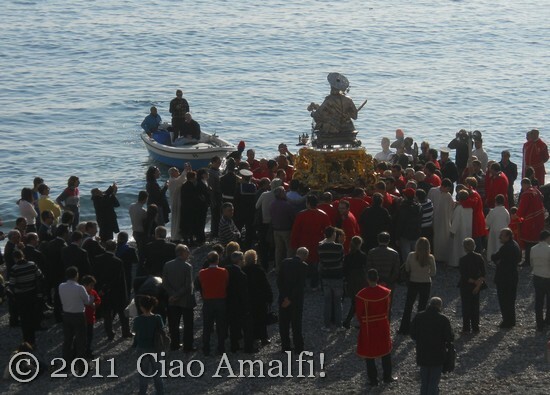 It’s traditional for the people of Amalfi to touch the statue of Sant’ Andrea before, during or after the religious procession. I stopped by the church after with my fiancé to carry on the tradition, just as the Amalfitans have done for centuries. 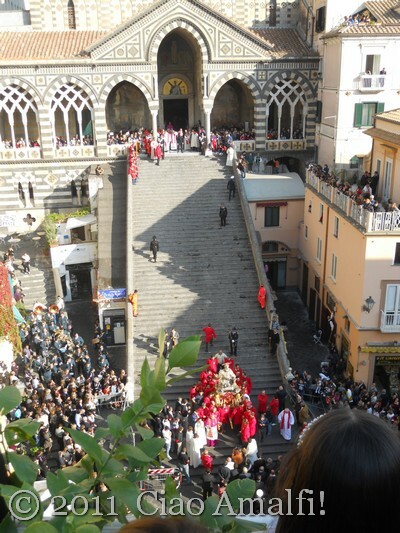 Experiencing this religious festival is one of the highlights of each year for me in Amalfi. 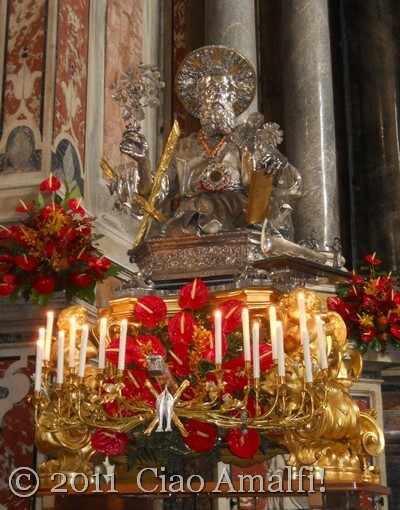 If your travels bring you to the Amalfi Coast in June or November, d0 come and join the Amalfitans in celebrating their patron saint and protector Sant’ Andrea!